Legislative leaders in conjunction with the Administration announced the convening of a legislative conference committee to discuss potential changes to laws related to wildfire liability. The Committee is meeting during the final weeks of this session and will use SB 901 as a vehicle for any proposed changes to law. CSAC has significant concerns about retroactive or future changes to utility liability laws that are being considered by this conference committee. The Governor recently submitted a proposal that would make fundamental changes to inverse condemnation, a constitutionally granted property right. See more information about inverse condemnation and CSAC’s efforts on the issue below. Current liability laws provide a strong incentive for utilities to take action and invest in critical safety measures that protect ratepayers and residents. Electricity does not have to come at the expense of public safety. Inverse condemnation is a powerful incentive for utilities to be as safe as possible. What we should be focusing on is how to make sure utility operations are as safe as possible to prevent loss of life and destruction. CSAC has been leading on efforts in the Capitol to prevent any changes to utility liability law in the last weeks of session; holding a recent press conference in Santa Rosa and submitting a joint local government association advocacy letter to the Committee expressing significant concerns. 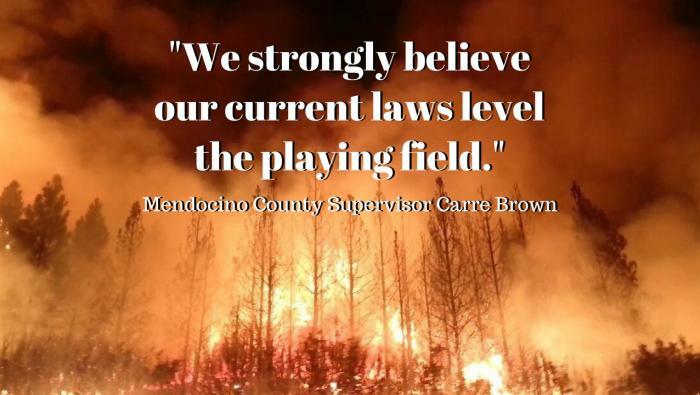 In addition, Supervisors Dillon and Brown recently addressed members of the committee and urged them to consider the impact of any hastily made changes to liability law during the last weeks of session and instead suggested they focus on fuel reduction, forest management and improvements in utility fire safety policy and technology. CSAC will continue to work on this issue as a top priority until session ends on August 31st. Read the detailed memo here. Click here for facts about inverse condemnation. CSAC joins together with consumer, insurance and victims advocacy groups from across the state to prevent changes to utility liability law.